Mayor de Blasio will meet with all five police unions Tuesday amid a rift that's been showcased very publicly in recent weeks, NBC 4 New York has learned. De Blasio will meet with the leaders of Captains Endowment Association, the Lieutenants Benevolent Association, the Sergeants Benevolent Association, the Detectives' Endowment Association and the Patrolmen's Benevolent Association, according to a public schedule released by the mayor's office. The private, closed-door meeting will also include Police Commissioner Bill Bratton and some senior leaders of the NYPD. The SBA tweeted Monday night: "Broken trust between communities & police will end. We're going to fix it here in the NYPD & set the stage for the rest of the nation." The news comes after de Blasio was met with a mixture of boos and applause as he addressed nearly 1,000 police recruits at their graduation ceremony Monday. 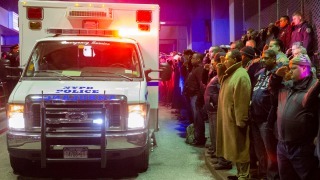 The mayor went on to salute their commitment to the city and vowed to protect them as he paused to remember the two NYPD officers slain by a gunman in Brooklyn nine days ago as they sat in their squad car. "We lost two peacemakers ... we lost two heroes," the mayor said to the sea of blue across from him at Madison Square Garden. "They stood up for all that was good and right. They gave us hope by their presence among us, and they will not be forgotten. They must not be forgotten." On Saturday, hundreds of police officers turned their backs to a video monitor as they watched de Blasio at the funeral for NYPD officer Rafael Ramos, one of the two officers killed Dec. 20 by Ismaaiyl Brinsley, who fatally shot himself in a nearby subway station shortly after the ambush. The other officer killed, Wenjian Liu, will be laid to rest Sunday. Speaking to the recruits Monday, de Blasio said, "You'll confront all the problems that plague our society, problems you didn't create." Someone in the crowd yelled, "You did!" Brinsley suggested in online posts that the officers' deaths were in retaliation for the police-involved deaths of Eric Garner on Staten Island and 18-year-old Michael Brown in Ferguson, Missouri. Grand juries declined to indict the officers in both cases, prompting protests across the city and the country. Police unions have criticized de Blasio as too sympathetic to protesters. Patrolmen's Benevolent Association President Patrick Lynch, one of the mayor's most vocal critics, sat about two rows behind him at the ceremony Monday as Bratton, who has said it was wrong of some officers to turn their backs to de Blasio at Ramos' funeral, sat to the right of the seat the mayor vacated to deliver his remarks. Many of the 884 new police officers applauded politely in their seats when de Blasio was introduced to speak. But audible boos could be heard from some in the crowd in the seats reserved for the cadets' family and friends. About a dozen or so people in the stands stood with their backs turned to de Blasio, emulating the searing pose of disrespect that some officers struck at Ramos' funeral. Asked about the booing, the mayor's administration sent out a statement pointing out several New York City mayors, including Michael Bloomberg and Rudy Giuliani, were also booed at police graduations. De Blasio was met with polite applause through most of the ceremony, though, as he pledged to continue the city's multi-hundred-million-dollar investment in officer training and safety. "We'll be investing in you because it is the right thing to do – because we need you, because we believe in you, because we know this investment is worthy," de Blasio said. "And we will work every day to deepen your relationship with the communities you serve, for the safety of all, for the betterment of all. Asked about the tensions between the department and the administration, several recruits told NBC 4 New York they wanted to focus on the positive and meet the challenges in front of them. Additional investments announced Monday include tablets in every patrol car and smartphones for each officer so police have "real-time information" to keep themselves and the communities they serve safe.